I have to admit it…I have been stalking Hello, Sailor since I read that Joe and Katy Kindred were taking up this prime lakefront space. Kindred is one of my favorite restaurants here in the Queen City. It was much anticipated at our house, as we drooled about menu possibilities weekly. As much as I wanted to go on their opening night, I knew it would be insanely busy (and it was). Luckily they started lunch service right around my birthday. It was kismet. We arrived at Hello, Sailor 11:30 am and were quickly brought to a table (by the time we left at 1pm, there was a wait). Reservations are not accepted here. The inside space is not very large; about 1/3 of the space is a large, cozy bar. The other side of the indoor restaurant is reserved for dining tables. From each spot you have a wonderful view of Lake Norman. Hello, Sailor has a nice beer, wine and cocktail list. Not too many choices, not too few. Our server was so helpful in navigating the menu based on our drink preferences. The Subterranean Spritz was right up my alley. 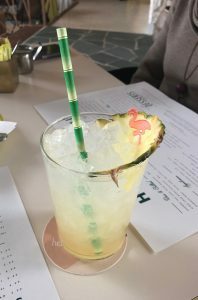 Once I saw that this vodka cocktail had smoked pineapple and key lime I was hooked. It was refreshing, tangy and sweet. They serve the same menu for lunch and dinner. It’s nice to not feel like you’re missing out by not coming to eat at a certain time. I wanted to order everything but unfortunately my stomach has its limits. We started off with the littleneck clams. This dish was superb! 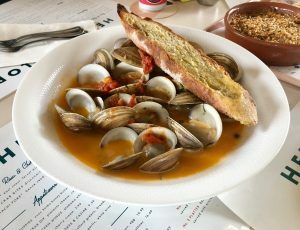 The clams were perfectly cooked, and the tomato, garlic, white wine broth…. oh the broth! It was drinkable for sure. We even had to order more bread to soak it all up. Next up was the Deviled Crab Dip. This was the only thing we ate that was just okay. Rather than being full of flavor it was just one note. It would have been better had it been a little creamier as well. I’ll skip it next time for some more delicious choices. 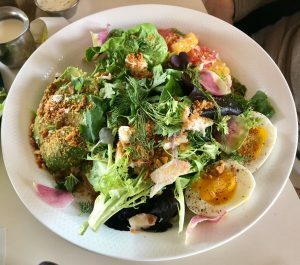 For a little greenery, we ordered two salads: the Grilled Caesar and the Citrus Crab Louie. 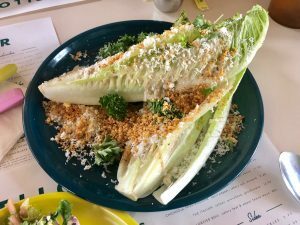 I love the twist on a classic Caesar saladwith the Grilled Caesar. The romaine is grilled so some of the lettuce is slightly charred. Finished with the homemade dressing, parmigiano and the buttery saltine breadcrumbs, it was a great accompaniment to the meal. You could even make this a meal by adding one of their proteins… like calabash shrimp or smoked chicken. The Citrus Crab Louis was so fresh, and the dressing- a homemade dill ranch-like concoction- was creamy and herby. But as you can see, there wasn’t much crab. It would be perfect if there was more of the succulent crab added to the salad. Now onto our favorite part of lunch, the Hamachi Poke. If you like raw fish, this is an absolute must try. Underneath the greens is a mix of delectable raw hamachi, and a mind-blowingly amazing crispy black rice. The textures in this dish are beyond perfection. The creamy asian style sauce looked like it might overwhelm the poke, but it really was well balanced. If you thought I was done, you were wrong! I had to get one more yummy entree. 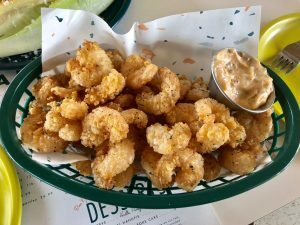 We ordered the Calabash Shrimp, which is a style of frying using buttermilk and a seasoned flour, which gives a light coating to the shrimp. Hello, Sailor offers it as an a la carte dish. When you see the price, you feel like it should definitely include a side, but when we got the shrimp it was a huge portion. There is a list of sides on the menu to order if you would like to purchase one or two. This is another plate that is perfect for sharing. The shrimp were smaller, which is my preference, and cooked very well. The seasoning was spot on with salt and a hint of spice. I would definitely order these again. To my surprise, I got a little birthday treat! 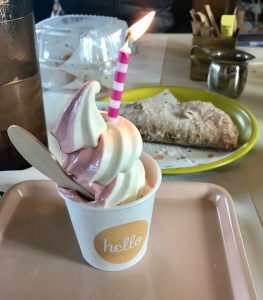 A cup of Hello, Sailor’s swirl ice cream, which was vanilla and pomegranate that day. It was sweet and creamy without being too heavy. 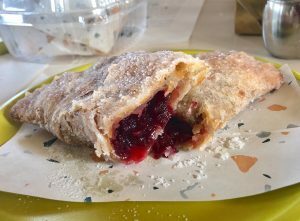 Then to top it off they brought us a seasonal handpie, which happened to be cranberry and ginger. I didn’t get too much ginger but wow was the filling delicious! The pastry crust was perfect…light and flaky. It melted in my mouth. After our meal, our wonderful server, Bernadette, took us to the window where she explained what else was going to be happening on the decks. A covered, heated patio is slated to open soon. This will provide a good amount of seating. Then an uncovered, seasonal deck and Tiki bar will be opening when the weather gets a little warmer. Most of the seating at Hello, Sailor will end up being on their patios. I’m so excited for the summer scene at Hello, Sailor. We are thrilled to have a restaurant on Lake Norman that is so focused on food, drinks and service. Welcome to the neighborhood Hello, Sailor! Natalie Oriol is a mom of two who has traveled the continent with her family. Her love of coffee propels her days. Her love of wine and pizza propels her nights. When she’s not chasing her kids or reminiscing about Poutine, she’s blogging on The Ravenous Mommy. You can follow her on Instagram @ravenousmommy. Tagged American, Bar, Beer, Beer and Wine, cocktails, desserts, dinner, Full Bar, Full Bar Available, Gluten Free Options, lunch, New American, no delivery, no reservations, Outdoor Seating, seafood, Southern, tapas, trendy, wine. Bookmark the permalink.